America’s first pony car — the Ford Mustang — is celebrating its 50th birthday with a swoon-worthy new design and plans to go global. Ford Motor Co. was to reveal the 2015 Mustang Thursday morning at events in New York, Los Angeles, Shanghai, Sydney, Barcelona and its hometown of Dearborn. It goes on sale next fall in North America and will arrive later in Europe and Asia. The Mustang isn’t anywhere near Ford’s best-seller — Ford sells more pickups in a week than it does Mustangs in a month. But Ford says the Mustang has the highest name recognition and highest favorable opinion of any car in its lineup. And car companies count on beautiful sports cars to cast a glow over the rest of their offerings. “It’s an emotional connection to the rest of the brand,” said Jacques Brent, group marketing manager for large cars and SUVs. 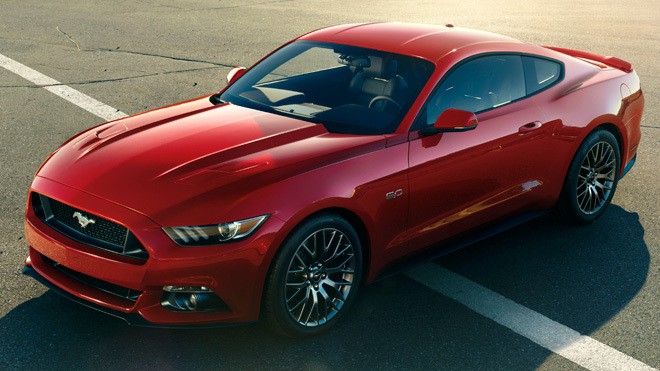 As for sales, Ford will be happy if Mustang can become the top selling pony car in the U.S. The Chevrolet Camaro, which followed the Mustang to market in 1966 and was last redesigned in 2009, has outsold the Mustang for the last three years and is on track to do it again this year, according to Kelley Blue Book. The result is a new car with plenty of cues from the old. The long hood and sloping fastback are still there, as is the trapezoid-shaped grille with the Mustang logo from the original. But the new car sits lower and wider, and the roof tapers dramatically in the front and back. The signature rounded headlights are smaller and sit back under a fierce, chiseled brow, while the traditional three-bar taillights are now three-dimensional and tucked beneath the rear deck lid. The Michigan-made car is currently sold overseas, but this is the first time it has been engineered to meet various international safety and emissions standards. A right-hand-drive version is being offered for the first time, for the United Kingdom and Australia, and Ford will market the car more heavily overseas. Chief engineer Dave Pericak said that while the design meets international needs, it wasn’t influenced by them. “We did not design a global Mustang. We designed a Mustang and took it global,” Pericak said. Even with Ford’s push, overseas sales will likely be modest, said Stephanie Brinley, an auto analyst with the consulting company IHS. IHS forecasts European Mustang sales will triple from current levels to around 2,500 in 2015, while sales in China will likely remain low because two-door coupes aren’t popular there. Coupes, in fact, make up less than 1 percent of sales annually across the globe, Brinley said. But they’re still an important car for automakers to have. “It’s an aspirational body style. It signals a sporty drive and a sexier product,” she said. Drivers will have three engines to choose from: updated versions of the current 3.7-liter V6, which gets a projected 300 horsepower, and 5.0-liter V8, with 420 horsepower, as well as a new 2.3-liter EcoBoost four-cylinder that gets a projected 305 horsepower. Ford will also offer updated six-speed manual and automatic transmissions. Final numbers for horsepower and fuel economy will be released later. The car sits on the Mustang’s first independent rear suspension, which should improve handling because it lets the wheels operate independently. Inside, new options include blind-spot detection and toggle switches that adjust the steering, stability control and other settings depending on the road conditions. The interior also has nicer materials, with brushed aluminum replacing painted plastics. Ford isn’t saying how much the new Mustang will cost, but the current one starts around $23,000. A convertible version will also be offered.